A tutor/mentor program is a place where idealism meets reality. Day 2 at o-net. mI was only able to attend the O-net conference for half a day Saturday. However, I read through all of the summary reports and blogs this morning. I hosted a conversation on Saturday, focused on creating a group of active o-net members who work to draw people from universities into o-net conversations, with the goal of recruiting resources to support o-net projects. As I said after Friday's day-long session, I'm really impressed with the talent of the people who are participating in the conference, and who have posted introductions at www.omidyar.net. 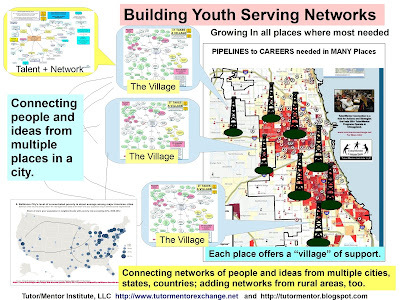 One person I talked to yesterday was a PhD student at Purdue, who is organizing information intended to be used to help connect people doing good work with resource providers. Another person was a technologist who had great ideas of creating alternative currencies that would encourage people to share talent with each other. A third was a women with an idea of creating visual databases to map assets. I was really inspired by the Peace Tiles project. I hope we can duplicate this in Chicago tutor/mentor programs and connect our kids with kids in African and on other continents. When I read one of the blogs, one person was questioning whether or not O-net was just a lot of talk, or if it was stimulating action (providing resources for O-net members to do their various projects). I'm hoping that my participation accelerates the rate at which people help each other, or draw new resources into o-net that end up helping members of the community do their work. However, until this happens it is idealism within a world where the daily papers remind us of reality. A few weeks ago I did a Mind Map of the Sunday Chicago Tribune. Today I did another. I found a really great story written by Mary Schmich, one of my favorite writers, telling how people had responded to an earlier story about a computer center in Cabrini-Green being flooded, with all computers destroyed. Because of her first story, people provided new computers, and everything else needed to get this site up and running again. That demonstrates the power of the media. However, in the same section of the Tribune Metro section was a story about a boy being fatally shot at a playground on the far South side of Chicago. There was another story on the same page about a Muslim teen center re opening, after being closed since 2003. These neighborhoods don't have a feature writer of the Chicago Tribune, or SunTimes, writing regular stories about life in these neighborhoods. Most of the times they get in the news is when something bad happens. My mind map linked these stories. Every time I read a story about Cabrini-Green, written by Mary Schmich, I just wish she'd end with "and this is just one neighborhood of Chicago where kids live in poverty and need extra help with volunteers, donors, technologist, etc." (and provide a link to web sites that people could use to learn about other places where volunteers, donors and technology are needed). If she and other reporters were doing this regularly, maybe people would have been helping the Muslim teen center get computers, and maybe the boy shot on a playground (or the shooter) would have been inside sitting at a computer rather than out on the street where something terrible happened. When I sit with my friends at O-net and talk about ideas, it is with an urgency of putting these ideas to work to help more kids in cities like Chicago have safe places where they can gather to learn, be mentored, have access to computers and the world around them. The reality is that while we talk of great ideas, we are losing kids to the streets and to poverty. Maybe I cannot convince the media to consistently tell the rest of the story when they write their stories about individual tragedies or triumphs, but maybe I can enlist a few technologist at O-Net to help me create a map gallery that would show where negative news happens and where volunteers and donors are needed. If hundreds of friends at communities like o-net were to take on the same goal, we might create a much larger public involvement and flow of resources to every place in the world where good people are trying to do good work to help people who need extra help. What about you? Can you help? I attended the O-Net conference in Chicago (Oak Park) today. More than 20 people from different parts of the world gathered to brainstorm ideas on how we might work together to make this a better world. The wonderful thing about this is that up till today, most of the people had never met face to face. They had met in the www.omidyar.net portal. The conference was the result of the efforts of just a few people who said, "let's get together" and who then used the o-net space to plan the entire event, even raising nearly $4,000 to provide scholarships so that seven people could attend, from as far away as Germany! I met many people who shared exciting ideas and who may someday be partners with the Tutor/Mentor Connection. I even met one person who had come to a Tutor/Mentor Conference many years before. The conference will continue tomorrow, and hopefully on the Internet after that. I hope that tutor/mentor stakeholders participate, and that some begin to use the new www.tutormentorconnection.org portal as a meeting space where some of them can launch actions that lead to more people coming together to help each other do good. Today was a busy day. I hosted a visitor from a mentor program in the UK, who was in Chicago on a Winston Churchill Fellowship. I attended the MY HERO AWARD lunch hosted by the Abraham Lincoln Marovitz Lend-A-Hand Program of the Chicago Bar Association. This recognizes lawyers, judges and law firms for their involvement in tutor/mentor programs. It as are love-fest for Judge Abraham Lincoln Marovitz, the inspiration behind the Lend A Hand, and for mentoring as an activities that enriches all who participate. Then I met with a guest from Northwestern University who was learning more about volunteer based tutoring. On the Internet if responded to people from Seattle and Kentucky who had contacted me after I was quoted in a news article about youth using the Internet. These are all connections intended to increase the number of comprehensive volunteer-based tutor/mentor programs in Chicago and other cities. Tomorrow I'll be attending the Omidyar.net conference in Chicago and next Thursday and Friday I'll attend the National Conference on Volunteerism and Service in Washington, DC. My goal from all of these is to find people who'll work together to increase the flow of volunteers and flexible operating dollars to all of the tutor/mentor programs that are now operating in different parts of Chicago, and to groupw who want to start new programs to fill voids where there are no programs. The Lend A Hand Lunch is an example of how an industry can begin to draw the attention of its members to tutoring/mentoring. The Lend A Hand not only raises visibility. It raises dollars. 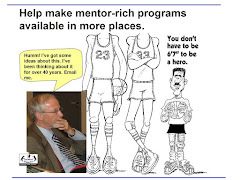 If such programs duplicate in every industry, and in every major cities, it can lead to a distribution of volunteers from different backgrounds into tutor/mentor programs in every poverty neighborhood, and a flow of resources so that experienced staff is in place to mentor students and volunteers to build long-term, life changing relationships. I'll post my results, and my observations over the next few days. No Child Left Behind, what's missing? It's not too early for American's to be thinking of the 2005-06 school year and efforts that need to be taken to help more kids get the help they need to succeed in school and move on to the next level. The big attention-getter in inner-city education is the No Child Left Behind law. It's causing schools to set aside money for private tutoring services to provide extra tutoring to kids attending poorly performing schools. On the surface, this sounds great. But something's missing. What's missing is a strategy to engage adults beyond the poverty belt in the work of raising kids and preparing them for careers. There are more than 135,000 school age kids in Chicago who qualify for supplemental tutoring. I'm sure that other big cities have similar numbers. While the number of children receiving these services is growing, it's still far short of where it needs to be, and the quality of the tutoring is suspect in many cases. However, I'm not here to debate the quality or usefulness of the Supplemental Tutoring Services. My point is that this is not enough. Supplemental tutoring only focuses on academics. It does not focus on social, emotional, civic engagement, or aspirations or enrichment. It's not a vocational education program aimed to keep teens in school and headed to jobs. Kids living in areas of high poverty come to school with far fewer learning experiences than do other kids because their families and neighborhoods don't have a wide range of people working in different jobs and careers. Instead, they have a greater number of adults who model illegal work, are ex-convicts, or on welfare. Instead of a network of adults helping kids move to legal careers, just the opposite exists in too many poverty neighborhoods. Supplemental tutoring does not increase the diversity of adults, or of experiences, available to inner city kids. Thus, volunteer-based tutoring/mentoring programs that connect youth with volunteers from many work backgrounds, and/or connect kids with arts, technology, literacy, college & career readiness, travel, etc., all offer additional supports that cannot be provided by the neighborhood or the family. In many of these programs kids and adults stay connected for many years. This seldom happens with Supplemental Services or paid tutoring services. If we accept the value of volunteer-based tutor/mentor programs, then the next concern should be the availability of such programs for kids of every age group, in every poverty neighborhood. At www.tutormentorexchange.net is a Program Locator that you can search by zip code and age group to determine if tutor/mentor programs are available in a neighborhood of Chicago. In too many cases there are few programs, or the programs that exist only serve small numbers, or are limited in scope. So, let's go back to the No Child Left Behind law. By only engaging a para-professional tutor to be an additional adult in the life of a child, the system is not strategically trying to expand the resources available by attracting and educating adults from beyond the poverty belt who could be a growing army of tutors/mentors, leaders and advocates. It is not creating a bridge between the workforce and diversity needs of American industry and the kids who need consistent, on-going, long-term help to get to careers. On July 28th the Lend A Hand Program at the Chicago Bar Association (http://www.lend-a-hand.net) will host a MY HERO Awards event to recognize lawyers, judges and law firms who have become involved in tutor/mentor programs. This is an example of a capacity-expanding event. As lawyers get involved with tutor/mentor programs they are beginning to work collectively to raise new, private-sector money, that can sustain existing programs and help fund new programs. This is what's missing in the No Child Left Behind Strategy. Their is no attempt to build a bridge between non-poverty and poverty. Their is no recognition that we need to be tutoring and mentoring adults, so they do more of what they need to be doing to make sure every child born in poverty is starting a job/career by age 25. Unless we expand capacity, we don't expand or sustain services. It's not to late to take action to change this. Anyone can become a foot-soldier to help mobilize more people to be part of tutor/mentor programs as school starts in six to eight weeks. If you'd like help, visit http://www.tutormentorconnection.org and join in the on-line discussion forums. What's missing does not need to stay missing. It's up to us. Imagine the benefit if business was competing to see who could do the most good for inner city kids and familes. Yesterday morning (July 5th) I opened a letter from the leader of a program in Lawndale, titled Young Men's Educational Network. His first paragraph said, "It is getting HOT here in Lawndale. And not just the temperature!Yesterday, one young many was killed, and another boy was critically shot. It seems that the heat of summer is often accompanied with increased violence. He went on to say, "I must admit, I don't look forward to summers here in Chicago! Many of the young men in YMEN share my feeling. They don't mind the time off of school, but they understand how easy it is to get into trouble when you have so much empty time on your hands." Shortly after reading this a teen in the Cabrini Connections program came to the T/MC center and told us that a student who had been part of Cabrini Connections during the 2002 and 2003 school years had been shot in Cabrini-Green. Thus, I share the feelings of my friend who leads the program in Lawndale. He could have been speaking about any inner-city neighborhood, in Chicago, or New York, Detroit, Dallas, LA. The details would be different. The problem would be the same. However, this is a year-round problem, not just a summer problem. Tribune articles this past week have reinforced the link between poverty and poorly performing schools. They say that low income kids who are part of schools where most kids are not living in poverty get better grades than the same kids attending high poverty schools. While it would be ideal to think that all 200,000 school age kids in Chicago who live in concentrated poverty could be bussed to some suburban school with open space, it's not realistic. Let's instead talk of ways to make schools in high poverty neighborhoods better. Let's talk about providing alternatives to gangs and street violence. The Cabrini Connections teen who was shot in Cabrini-Green was Devon Otis. He was with us during his 7th and 8th grade years. We don't know why he stopped coming. He was here more than 83% of the time during his second year. I do wonder if we could have done more to keep him involved with Cabrini Connections. It frustrates me not to havethe resources to do more of the things I know need to be part of the services we offer. On Tuesday and Wednesday, I looked in the news and metro and obituary sections of the two major Chicago papers (Chicago Tribune and Chicago SunTimes) for information about Devon's shooting. Sometimes the papers turn stories like this into headlines, and follow with editorials that shout "Do Something!" Most times a shooting in Chicago gets a small paragraph in the Metro section. For the past two days I found no mention of this shooting. Maybe the local news media think their readers would rather read about American's being killed in Iraq instead of in American cities. Maybe they don't want to scare the people buying high priced condos near Cabrini Green. Maybe there's just too much of this to report every death with a profile like the ones of soldiers killed in action. If not enough people care about what's going on in our cities, maybe some day they will be breeding grounds for future terrorist. Instead of killing each other.... I hope not. That's why we work so hard to make volunteer-based tutor/mentor programs available in inner city neighborhoods. Programs like Cabrini Connections can expand the network of mentors and learning experiences available to inner-city youth during the non-school hours. But they cannot do this with the type of inconsistent support thatmost of them receive from various funding sources. This is why I'm proud to have been a partner in the growth of the Lend A Hand Program at the Chicago Bar Association since 1994. The CBA is raising visibility and recruiting volunteers and donors to support volunteer-based tutor/mentor programs throughout the Chicago region. They don't pick just one program, like some business and professional associations do. They use the T/MC database and maps as a guide for providing support into all neighborhoods where tutor/mentor programs are needed. If we can encourage accountants, engineers, alumni, civic and social groupsto take on the same mission, we can dramatically increase funding for tutor/mentor programs and that will improve the consistency and quality of staffing and services. The only way this vision will be a reality is that volunteers who are connected with inner city kids, and who are accountants, engineers, lawyers, and members of alumni associations from various colleges, go back to their networks and say "We've got to do something more than what we're already doing." The purpose of this Blog is to reach out to people who are tutors, mentors, board members in tutor/mentor programs all over the country. We're using our web sites as a meeting place where you can talk about your involvement in a tutor/mentor program, and you can brainstorm ways to make tutor/mentor programs more effective, and more available. Where can you find more information? Where can you talk about this with peers from Chicago or from other cities? Visit the new T/MC web site, that has been created for us by IUPUI. By mid August this will replace the content at the http://www.tutormentorconnection.org site. Anyone who reads this blog can forward it to people they know who are already involved with tutoring and/or mentoring programs. The links have examples of what some business and professional groups are doing. If more people use the web site, we'll gather additional examples. Then as we point business and professional people to web sites that show what competitors are doing, maybe we'll spark a competitive interest that will encourage others to duplicate the best work being done by others. Imagine the benefit if business was competing to see who could do the most good for inner city kids and families. When I come to work each morning, I have an "If it is to be, it is up to me" attitude. I invite you all to take that same ownership approach to making comprehensive, volunteer-based tutor/mentor programs more available to more kids in Chicago and in other major cities. As we celebrate freedom this weekend and honor the men and women fighting overseas, I hope we'll also honor those who are fighting poverty and terror in America's inner-city neighborhoods. Below I've posted the first two paragraphs from a call to action article on the Office of Juvenile Justice and Delinquency Prevention web site. They state this call to action better than I can. I hope that after you read this you'll use the links at the left as a path to your own growing involvement in this war on terrorism. This Nation must take immediate and decisive action to intervene in the problem of juvenile violence that threatens the safety and security of communities -- and the future of our children -- across the country. Demographic experts predict that juvenile arrests for violent crimes will more than double by the year 2010,1 given population growth projections and trends in juvenile arrests over the past several decades. There is, however, reason for hope. Juvenile violent crime arrests are increasing, but only a fraction of youth (one-half of 1 percent) is arrested for violent crimes each year. We can interrupt this escalation of violence based on identified positive and negative characteristics -- protective and risk factors -- that are present or lacking in communities, families, schools, peer groups, and individuals. These factors either equip a child with the capacity to become a healthy, productive individual or expose that child to potential involvement in crime and violence. Of equal importance, communities are learning that they can make dramatic changes in delinquency levels by taking steps that successfully reduce the risk factors and strengthen the protective factors in children's lives.